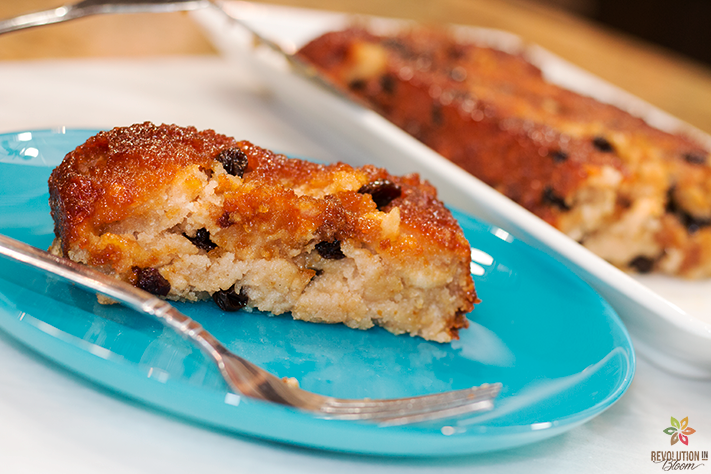 This delicious Cuban version of bread pudding will be hard to put down! Add your dried and stale bread to a food processor and process until you get bread fine crumbs. Set aside. Next, with an electric mixer mix your aquafaba for about 3 minutes or until you achieve a light white foam. Add in your cornstarch and mix with the aquafaba. Then add in your bread crumbs along with the rest of your pudding ingredients and stir everything together with a wooden spoon or spatula until fully combined. Bread crumbs should be completely moist and no dry spots should be left. If there are, add a couple of extra tbsp of the evaporated milk. The mixture should resemble a thick pound cake batter. Set aside. Prepare a simple caramel by adding 1 1/4 cup of sugar to a small sauce pot over medium high heat. Stir sugar until it completely melts and caramelizes. Once sugar fully melts, immediately take pan off the heat and pour caramelized sugar into a bread baking pan that has been sprayed with a light coating of oil. Carefully spread melted sugar across the the whole bottom of the pan and slightly up the sides. Allow sugar to cool and harden for about 3-5 minutes. Then pour in your pudding mixture into the pan and spread evenly as well. Place bread pan into the oven to bake for 25min. Once pudding has baked, run a knife along the inside edges of the pan to help loosen the bread pudding. Then place a larger rectangular serving dish over your pan and, with oven mitts on, carefully flip pan over onto the serving dish. Tap the pan a bit to help the pudding come out. Serve immediately or allow to cool in your fridge for up to 5 days. ENJOY!